Crossrail breaks through under City Jump to media player Crossrail workers have made their latest breakthrough by tunnelling under the City of London. A tour through Crossrail's tunnels Jump to media player With just four years until Crossrail is due to open, Transport Correspondent Richard Westcott was given access to the new tunnels beneath London to see how work was getting on. Crossrail 2 route outlined by mayor Jump to media player A preferred route for a proposed £20bn Crossrail 2 scheme running north-south through London is identified by Mayor Boris Johnson. New Crossrail tunnel unveiled Jump to media player London's newest tunnel under the Thames has been unveiled - The Thames Tunnel - which is part of the £15bn Crossrail project. Black death pit unearthed by Crossrail Jump to media player Human skeletons unearthed in London Crossrail excavations have been found to be Black Death victims from the great pandemic of the 14th Century. Can London cope with Crossrail impact? Jump to media player Questions have been raised over how central London will cope with the influx of people which Crossrail will bring into the area. A look inside the Crossrail project Jump to media player BBC London takes an exclusive look inside Crossrail to see how the transport scheme is taking shape. Crossrail workers have made their latest breakthrough by tunnelling under the City of London. 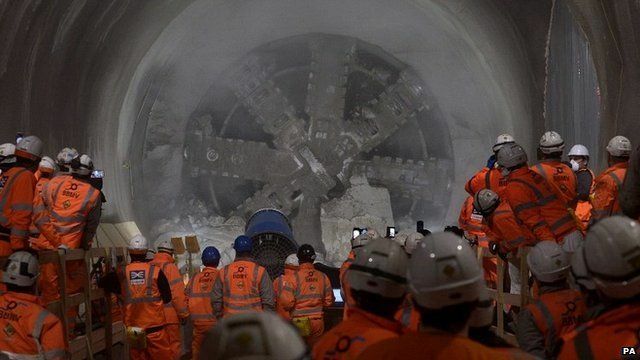 The £14.8bn project's 1,000-tonne boring machine has broken into the eastern end of Liverpool Street Crossrail station. By 2018 high-speed trains will run from Reading, through central London to Abbey Wood and Shenfield in Essex.